The American Childhood Cancer Organization (ACCO) has honored and commemorated thousands of children since the year 2000, who have had their lives turned upside down by childhood cancer. 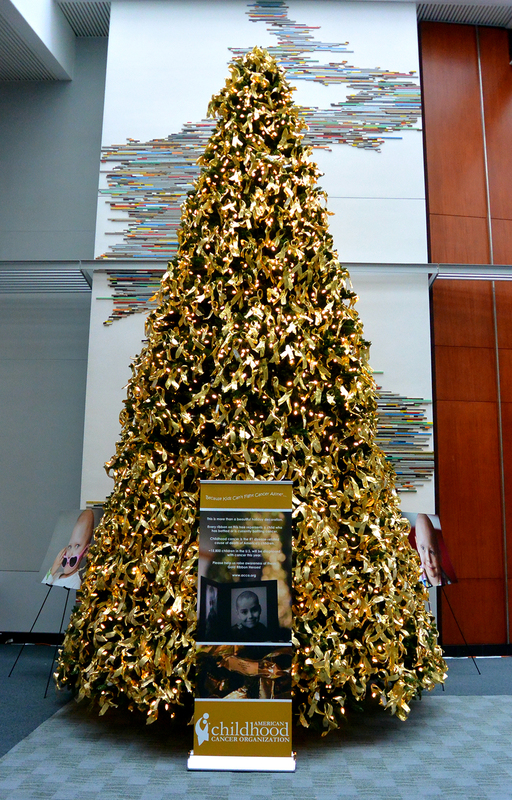 Each year, our over 20-foot-tall tree is decorated with thousands of gold ribbons, each ribbon bearing the name of a child who has been affected by childhood cancer. Order your ribbon today and join us as we Light Up the Holidays with Hope! Click HERE or on the gold banner below. Add the child’s information: name, age, state, and optional tribute. All purchases made by Friday, December 7th will appear on this year’s Awareness tree in Newport Beach, California. Any purchases after this date cannot be guaranteed placement on the tree. Click HERE to view the Tributes list that includes every ribbon submission for 2018. Please allow 1-2 business days for your ribbon and tribute to appear on this list in alphabetical order by first name. Note: More than one ribbon may be purchased for each child. After the holidays, you will receive your child’s ribbon in the mail. You can see our National Awareness tree proudly displayed at the Marina Park in Newport Beach, California from December 19th – 23rd, during the Holiday Boat Parade! For updates and reminders, follow us on Facebook and join our mailing list! For questions or concerns, email staff@acco.org. To learn about the history of our Awareness tree, click HERE.